I’m delighted to offer several different types of meal plans, each of which has been designed to help you live your most delicious and vibrant life. Whether you’d like to drop a few pounds, lower your cholesterol, stabilize your hormones, manage diabetes, quiet an autoimmune condition, or dive right into a 28-day healthy total eating refresh to reset your metabolism, there’s a plan for you! Each one will introduce you to new, healthy meals that are not only delicious but also quick and easy to prepare – so try them all if you like! I promise, if you stick to your meal plan for just 3 months, you’ll look and feel better than ever. Each week, you’ll receive a customized meal plan delivered directly to your email inbox. Your plan will include meals and snacks for each day, as well as a grocery list – so shopping will be a breeze. Subscription plans start as low as $9/month. No credit card is required if you’d like to check it out for free for the first 3 days. You can cancel at any time, but I know you’ll love it! These meals contain all vegan recipes and are especially high in fiber, antioxidants, vitamins and minerals. They’re a great choice if you want to reduce your cholesterol and blood pressure, or if you want to experiment with more plant-based eating and need ideas, recipes and inspiration. The meals and snacks on this plan are full of inflammation-fighting ingredients which can be especially beneficial for anyone with autoimmune diseases like rheumatoid arthritis, celiac disease, psoriasis, fibromyalgia, autoimmune thyroid diseases, lupus, etc. Meals and snacks are low glycemic index, gluten-free, light on dairy and legumes, and provide high-quality proteins. These are lower carb, low glycemic index meals. They’re a great choice for managing not only PCOS, but also diabetes/prediabetes, metabolic syndrome, or for anyone who wants to lose that stubborn belly fat. The 28-Day Refresh Plan is a great choice for anyone who wants to keep each month healthy, balanced, and on-track. Consider it your own monthly healthy eating challenge! 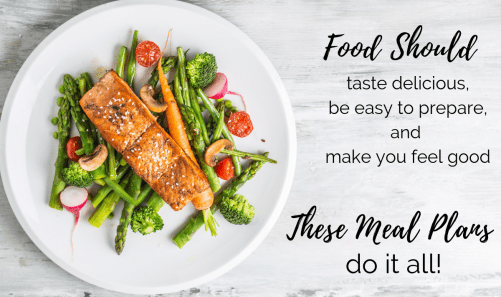 Want to eat better but don’t have time to plan, shop and prep? 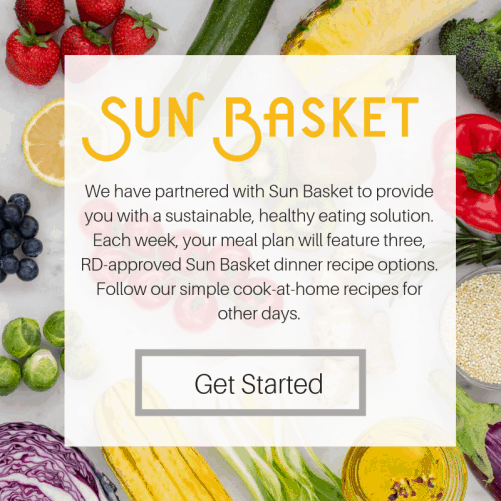 Sun Basket meals are the perfect choice! Receive recipes and ingredients in each box each week and whip up balanced and healthy gourmet meals in about 30 minutes. All meal plans are easy to use and completely customizable. Recipes include nutrition information to help you meet your goals, and the planner creates a grocery list for each day or week. Watch the video below to see how they work. If you’re not sure which plan is best for you, CONTACT ME and I’ll be happy to help.